GM plans to display five all-electric vehicles including a concept Buick SUV it says can travel 600 kilometers on one charge, plus a hybrid Cadillac XT5 28E. The biggest global auto show of the year showcases China’s ambitions to become a leader in electric cars and the industry’s multibillion-dollar scramble to roll out models that appeal to price-conscious but demanding Chinese drivers. Auto China 2018, which opens this week, follows Beijing’s decision to allow full foreign ownership of Chinese automakers in a move to make the industry more flexible as it promotes electrics. “Just in the last two or three years, China rose from being a very small player in the global EV market to be nearly 50 percent of sales in 2017,” said Christopher Robinson, who follows the industry for Lux Research. “It attracted nearly every automaker in the world,” said Robinson. Starting in 2019, automakers will be required to earn credits by selling electrics or else buy them from competitors. More stringent fuel efficiency standards will require a big share of each brand’s sales to be non-gasoline models. “There is huge potential for vehicle electrification here,” said Roland Krueger, chairman of Infiniti Motor Co., Nissan’s luxury brand. The Detroit automaker, which vies with VW for the status of China’s biggest brand, is launching 10 electrics or hybrids in China from in 2016 to 2020. China’s BYD Auto, the biggest global maker of electrics by volume with 2017 sales of 113,669 units, plans to unveil two new hybrid SUVs and an electric concept car. The company also plans to display nine other hybrid and plug-in electric models. The sleek Q Inspiration has no air-drawing engine, and thus no front grill — a change Krueger said was suggested by Chinese designers at Infiniti’s Beijing studio. “The first car is going to cater specifically to the needs of the Chinese market,” said Krueger. Ford Motor Co. has announced a “product onslaught” this month for China that includes at least 15 electrified vehicles and 35 other models through 2025. Ford’s first plug-in hybrid in China, the Mondeo Energi, went on sale last month. Automakers complained joint ventures were cumbersome and expensive but complied because they gained access to a market that passed the United States in 2009 as the world’s biggest. Last year’s sales of SUVs, sedans and minivans totaled 24.7 million units, compared with 17.2 million for the United States. 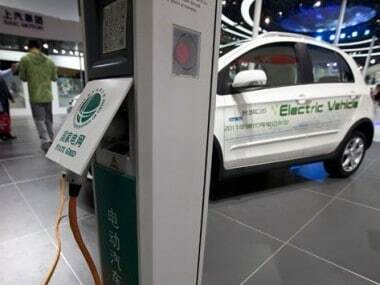 The Cabinet’s planning agency announced last week Beijing will loosen those controls by allowing full foreign ownership in the industry, starting with electric vehicle producers this year. Limits for commercial vehicles would end in 2020 and for all passenger vehicles in 2022. That would end a 50 percent cap on foreign ownership of an auto venture, a limit that required automakers to share technology with potential competitors, adding to President Donald Trump’s trade complaints against Beijing. “Now you’re going to see the difference between the partners that you want and partners imposed on you,” said Carlos Ghosn, chairman of the Renault-Nissan-Mitsubishi alliance. Still, while electrics may be China’s future, most brands lose money making them. Profits come from sales of SUVs that are wildly popular with Chinese drivers who see them as the safest option on the country’s rough, chaotic roads.